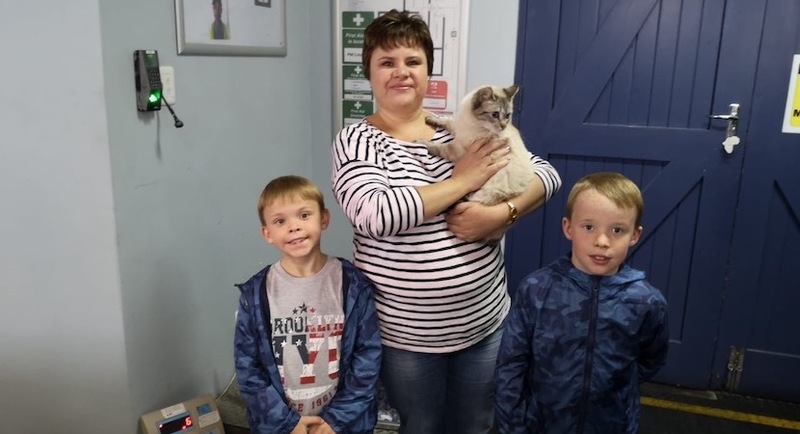 Meet Charlene Barnes, a woman who has the unenviable task of trying to save the unwanted and abused pets and strays of Witbank, now known as eMalahleni. Many of us care about the welfare of animals, but find it hard to engage fully in organisations such as the Society for the Prevention of Cruelty to Animals because we may not want to experience the hardship that the wonderful workers at the SPCA have to see every day. Charlene shared some of the shocking statistics of the SPCA in her area with us. In the last three months of 2018, they had to put down 183 pets at their branch. The branch also runs preventative programmes, encouraging owners to chip, neuter and vaccinate their pets. Charlene’s love for pets and especially cats including the big cats like lions and leopards stems from a natural affinity towards animals from birth. Her decision to become more involved comes from her grandfather, Gerald Barnes who belonged to the Rotarians and encouraged his offspring to give back to the community. Until four years ago, her participation in the SPCA was sporadic as she thought that working with abused pets would be too upsetting. Now she chairs the Witbank branch of the SPCA. Linda van Tilburg asked her what changed her mind? It’s not an easy task to do. For many years, I refused to go there. When I joined the committee, I was adamant I wouldn’t go and spend time there. I would do the work outside that needed to be done – so, not have to go there. Eventually, I decided I needed to pluck up the courage and do that, which I did and I actually found myself enjoying it even though, you interact with an animal and maybe a week, two weeks’, or a month later that animal is no longer there. I think you have to try and put blinkers on sometimes, otherwise you’ll drive yourself insane. So, you can’t say it’s too upsetting? My heart is too soft? It is and we do get emotional. There are some that just speak to you and there’s one particular one that you fall in love with and you try really, really hard to find that one it’s home and if it doesn’t then you sit and cry about it afterwards. I see you’ve been quoted, that the whole process of animal rescue is like emptying the ocean one teaspoon at a time. I think you were quoting a friend. Is the task too much of mammoth task ? In South Africa, I think the task is becoming mammoth. Well, there aren’t enough homes for all the animals that we have and the educating of people to encourage them to sterilize, the importance of sterilisation – not having puppies, not having kittens – as hard as you try, that message just doesn’t seem to get through. Do you have the problem of Christmas puppies? Yes, we do. We have the same. E.g. The puppy doesn’t like my wife. My wife doesn’t like the puppy. It stands on the other dog or something like that. Those are some of the excuses you hear so yes, we do get that. We don’t encourage (and I don’t know if that’s the wrong word) people to give a puppy or a kitten as a Christmas gift because it’s a long-term commitment. It’s maybe 10/15/20 years of commitment. Do you find your job is worse at the moment with the way the economy is? It is, especially in our town. We’re a mining town. We have the power stations and a lot of those places are retrenching people. There aren’t enough jobs so the ones that suffer first are the pets. When it comes to advertising or when you try to get support for your cause, is there the risk that you might be putting people off if the images are too disturbing? Yes, there will be and sometimes… Even like when we do a cruelty case, we would like the public to see that cruelty but then we take a step back and say ‘sjoe, you could always get some backlash’. You will always get negativity. You need to be careful with what you advertise. You have to have some kind of impact but you don’t want the impact to be a negative impact. You try to make a positive impact. And South Africans in general: do you think people are still in love with animals? Is there support for your cause? There is and we’ve got some very good people in our town. What kind of money do you get into your charity? For example, at Christmas time, we get the opportunity to do the gift wrapping in one of our malls. The mall gives the opportunity to various charities so you each get a spot. There will be a children’s charity. There’ll be cancer. There’ll be SPCA. We’ve been doing it for many years and that is about two weeks of hard work – gift wrapping – but that we can make sort of R45,000/R47.000. We try to do bigger fundraisers than so many smaller ones that are time-consuming but you need to do the small ones as well to bring in those small amounts of money because every cent counts. 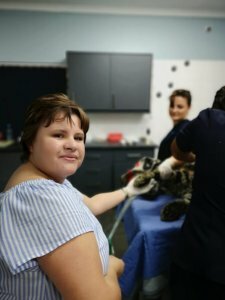 Do you find that the SPCA in South Africa has unique problems that overseas ones might not have? I believe your (UK) RSPCA; you are much stricter with prosecution and your rules. I mean, ours are strict but the perpetrators tend to slip under the radar or get away with it. I think yours are a lot stricter. Do you think that possibly, South Africa actually needs tougher regulations? Yes, we need tougher regulations and we need the support of the legal community – those types of people – to push the prosecutions and not let that slide. Well, thank you, Charlene. You’re an inspiration to people who’re really prepared to work so closely with a cause like that. Thank you for speaking to us. 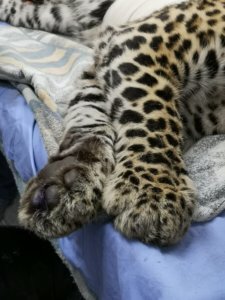 Charlene holding the paw of a leopard that was caught in a trap.